In today's Attorney at Work ezine ("One really good idea every day"), I follow up on my earlier posts (here, here and here) about the College of Law Practice Management's recent Futures conference. 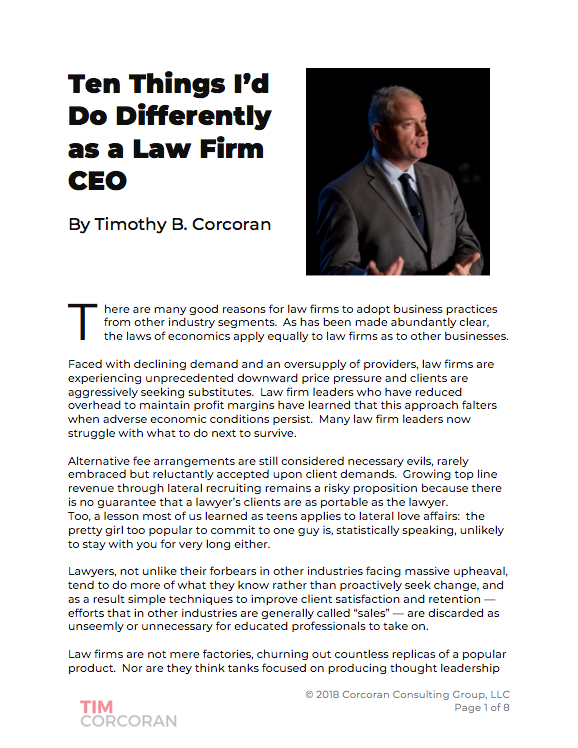 I write about the evolving structure of law firms and law firm pricing from both a law firm leader and law firm client perspective; I discuss some of the positive changes resulting from the UK Legal Services Act; and I heap more praise on two innovative law firms who have fully embraced efficiency and process improvement to boost client satisfaction. See the article here at Attorney at Work. For additional feedback on the Futures conference, see live blogs and recaps from Ron Friedmann (here and here and here) and Carolyn Elefant (here and here) and Inside Legal (here) and Toby Brown (here). Click here for a full recap of the robust Twitter stream, capturing multiple perspectives from a wide variety of thought leaders in attendance.